Fleeing her pursuers, Zam Wesell pushed her speeder to its limit on a harrowing, high-speed chase through the streets and buildings of Coruscant. Barely keeping the fast, highly maneuverable vehicle ahead of Obi-Wan Kenobi and Anakin Skywalker, Zam‘s flight ends in an explosive crash. 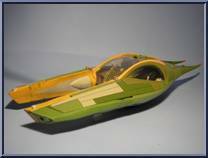 Contribute pictures, update details or suggest corrections for Zam Wesell Speeder. 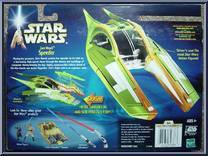 Write a review about Zam Wesell Speeder.